To commemorate the 25th edition of the SXSW Film Festival, we will spotlight careers launched, artists discovered, powerful performances, and more from our alumni. This week’s featured artist is director and writer Gareth Edwards. Edward’s directorial film debut, Monsters, world premiered at the 2010 SXSW Film Festival. Monsters won many accolades, garnering six nominations and three wins, including Best Director for Edwards at the British Independent Film Awards. Edwards was also nominated for a BAFTA award for Outstanding Debut by a British Director. The film was listed as one of the top ten independent films of 2010 by the National Board of Review and placed third on Moviefone’s Top 10 Sci-Fi Movies that same year. In anticipation of Edward’s second feature, the 2014 reboot of Godzilla for Warner Brothers, he presented a 60th anniversary screening of the 1954 original at SXSW. Audience members were treated to an exclusive first look of the remake. 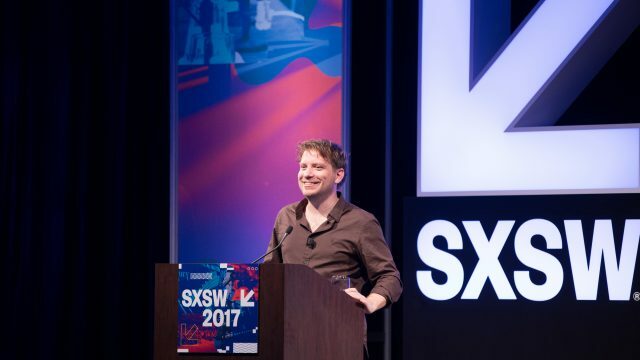 As director of the exhilarating Rogue One: A Star Wars Story, a chapter in the Star Wars Anthology series, Edwards returned to SXSW as a 2017 Film Keynote Speaker, where he discussed his career and his desire to join the rebel alliance after his first experience watching Star Wars. Rogue One was the second highest-grossing film of 2016 and went on to receive two Oscar nominations for sound mixing and visual effects. We are excited to share his #SXSWFilm25 story with you.